Today I had the opportunity to do a presentation on social media for LifeSource, the non-profit organization that manages organ and tissue donation in Minnesota, North Dakota, South Dakota and parts of western Wisconsin. I had been asked to do this because of a presentation I had done for the Minnesota Health Strategy and Communications Network. I told the LifeSource group I would provide a link here to my presentation; since it was substantially the same as the one I did in February, I’m just linking to that post. I will be interested to see what LifeSource does in social media; for an organization that is so volunteer-intensive and deeply affects so many people in a positive way, these tools are a natural way to give a voice and a platform to people who are passionate about this life-saving work. Here’s the Facebook group, Donate Life Minnesota, they have formed. I suggested they should talk with Scott Meis from the Donate Life Illinois campaign, where they’ve had a lot of success using social media. 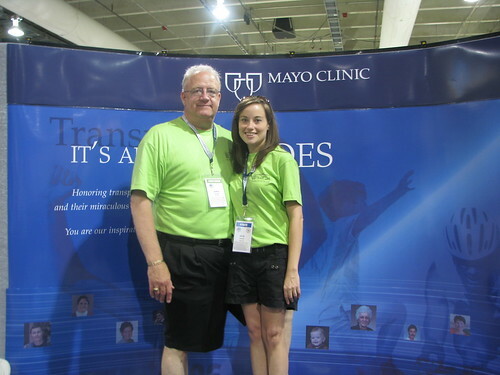 I’m also looking forward to connecting with LifeSource at the Transplant Games in Pittsburgh in July, where Mayo Clinic will have a booth as one of the sponsors. We will be having opportunities for participants in these Olympic-style events to share their stories via a Facebook group and in other ways.